Bhagawan says “The end of Education is Character” and “True Education is not for mere living, but for a fuller and meaningful life”. He has repeatedly urged parents to fulfill the spiritual needs of their children, insisting that parents should take up the responsibility of moulding the character of children who in turn will shape the destiny of the nation. The current education programme has its roots in the Sri Sathya Sai Bal Vikas programme which was started in 1969. 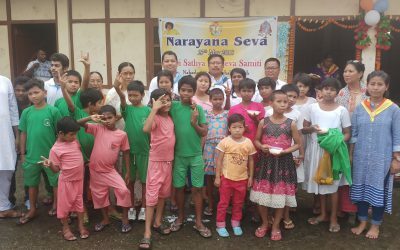 The non formal mode by the Sri Sathya Sai Bal Vikas classes (for children 5 to 13 years of age) held in residential homes and Samithi centers. The formal mode is implemented through the 99 Sri Sathya Sai Schools spread out in different states of India. 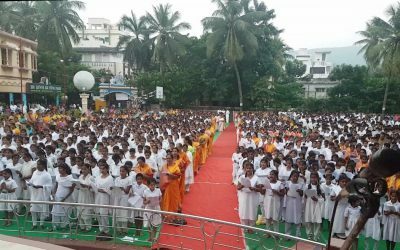 The Sri Sathya Sai Bal Vikas movement has grown in strength from 3000 gurus and 50,000 students in 1975 to 19,373 gurus and 3,30,961 students across 16,681 bal vikas centers now. The Sri Sathya Sai Bal Vikas course is based on two principles – Existence of God & Divinity of Man. 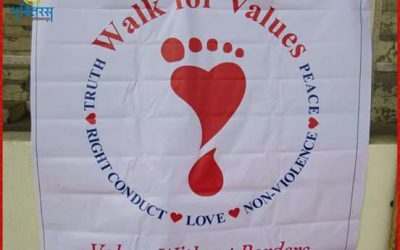 The classes are conducted to inculcate the five basic human values of truth, righteousness, peace, love and non violence in children. It is a secular programme inculcating in the tender minds of children, tolerance and respect for faiths and religions. 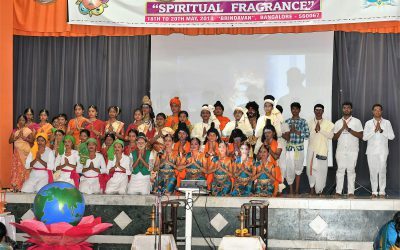 The Sri Sathya Sai Bal Vikas Movement aims at good habit formation over the nine year duration of the course so that the child on completion of the Programme emerges with a strong sense of discrimination and good character. The course helps to instill in children – timeless and universal lessons, such as respect and reverence. Its best teaching practices include the five techniques of Prayer, story telling, group singing, silent sitting and experimental group activities. Sri Sathya Sai Bal Vikas is a ray of hope in this troubled world, as it is based on the premise that each child is a unique creative being and when treated as such, learns to recognise his or her own true self. The 99, Sri Sathya Sai Schools in India cover more than 50,000 students and are run by a dedicated band of 2000 teachers. These schools are unique in as much as they inculcate the education in human value programme or Education in Human Values( EHV ) programme by integrating five universal core values in all curricular and co curricular activities in the schools. These values which form the core of the Sri Sathya Sai Educational Philosophy are universal and transcend all distinctions of colour, country, religion, caste and creed. They embrace all beings, as they recognise their source being inherent in each and every individual. The implementation of the EHV Programme is these 99 schools is guided by the National Council of Sri Sathya Sai Schools, India and the Institute of Sri Sathya Sai Education, India. The Educare Programme is intended to draw out the best in a child and to enable his/ her personality to develop towards excellence in all domains of personality, so that the child emerges as an integrated person with a strong sense of discrimination based on intuition, well – grounded in the values of the head, hand and heart and good habit formation. Such an individual achieves success not only at the physical and material level but also at the mental intellectual, emotional and spiritual world. Baba, the Universal Teacher introduced to the world the philosophy and concept of Educare and Integral Education. Bhagawan has always held that Education should be a means to translate these values in to action in day- to- day life for it is only when such practices are encouraged by parents at home and in our schools, can one ensure a happy home, a value based society, and orderly nation and a peaceful world.